I Think it May Have Tipped. The whole notion of disruptive technology and tipping points is fascinating but, I am hazarding a guess, utterly unscientific. It's also very hard to spot while it's happening and very easy to pontificate about it after the event. The seismic changes in the music industry are a good case. I would have bought CDs and DVDs in a big music store a few years back without ever imagining those massive institutions would soon just disappear. I probably had some MP3's on my computer but a CD was 'proper music' or something. I can't even remember. However, my seismic disruptive technology antenna are currently buzzing with fresh input. Without question there is a feeling going around that electric cars are starting to make real inroads into people's thinking. I'm not talking sales increases although they are taking place, even in the UK. I'm not talking charging infrastructure although that is expanding rapidly. More and more big car manufacturers are introducing more and more electric cars and more people are beginning to at least consider the possibility that burning fossils to move along might be getting a bit dated. I know they are still expensive to buy new, but in some ways this is my point. Every day I see cars that cost more than pretty much every electric car available, a lot of people buy a lot of really expensive fossil cars, the 1%. Two cars I've driven recently are proper game changers. The BMW i3 isn't like an existing car that's had an electric motor and batteries shoved in it, it's a totally new approach to how cars are made, what they're made from and how they move. The Tesla Model S is such an extraordinary machine that any of the dull old arguments about range, speed or looks are knocked into a cocked hat. I had a thought as I was driving. Up to now someone who can afford to buy a £50,000 plus car has had a huge list of excuses as to why they wouldn't buy an electric car. As of March next year when the right hand drive Model S arrives in the UK, those excuses will melt away like a polar ice cap. From that point on, when you see someone driving a high end Audi, Mercedes, Jaguar and the like, basically a car in a similar price range to the Tesla, we should shake our heads in dismay. Why drive one of those when the Model S is not only faster, better looking and more efficient, it's also ridiculously cheaper to run. 10,000 miles in a hefty V8 petrol executive car doing 25 mpg which is more than generous, is going to cost around £2,500 to drive 10,000 miles. 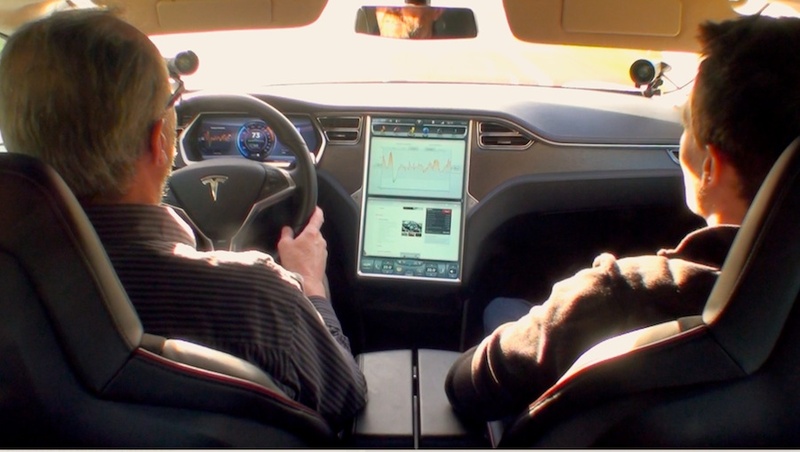 A Tesla Model S, driven at the same speed on the same roads will cover the same distance for £400. Now I will hear from someone who claims to average 85 mpg in their diesel Passat or something, but I am talking about big, posh cars that cost well in excess of £50,000, not economy sensible ones. I'm being generous to the petrol car and cruel and strict to the Tesla. Is it the tipping point? I don’t know for sure but it certainly feels like one.